The recent debate on the proposed Callington “Relief” Road has brought the concept of “induced traffic” back into the limelight. And also the the related and much neglected evidence for “reduced traffic“, or the delightful concept of “traffic evaporation”. So what do these terms mean? As car ownership and use have increased over the past 30 years the reaction to the pressure created by additional traffic demand has often been to increase the level of supply, in other words, provide additional road space. There is a growing body of evidence indicating that the benefits of creating additional road capacity are not as significant as was previously believed. In many cases, the provision of new road links simply increases congestion problems. This occurs through a process that is known as traffic ‘induction’. 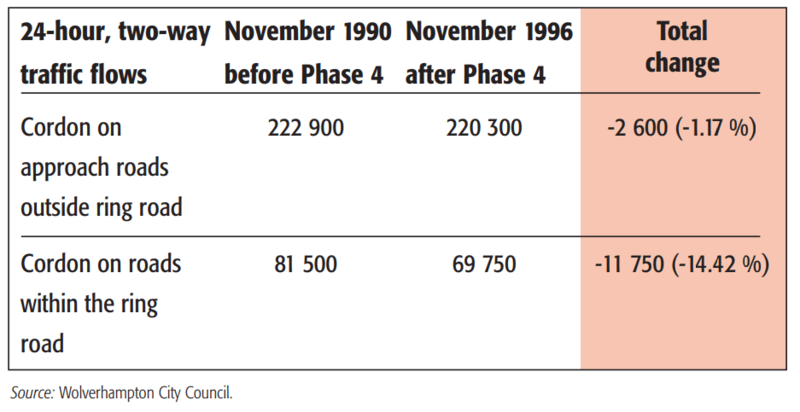 In 1994, the UK Government-commissioned Sactra report provided evidence on the impact of new road building on traffic levels in the area of the scheme. The report revealed that when new road capacity is provided, overall traffic levels in the vicinity of the scheme actually increase. The evidence does not offer a reliable means of predicting the extent of this traffic increase but case studies suggest that it is typically around 10 % in the short term, and 20 % in the longer term. In our cities, such as Bristol, there is an additional reason as to why the provision of additional road capacity is problematic for city planners — there is simply a lack of available space in which to expand. Two recent reports from the Campaign to Protect Rural England on “the Impact of Road Projects in England” and “The End of the Road, Challenging the Road Building Consensus” discuss the latest evidence on the failure of road building projects to do anything more than attract more cars, increasing noise, air pollution and accidents. There is also is sound research evidence to back the benefits and impacts of pedestrian improvements and road closures as set out in the new website from the UWE Centre for Transport and Society. So if building or widening roads causes more traffic, what happens when capacity is restricted or redirected? Chaos, surely? Well the evidence points to something else, something that unexpected, a phenomenon that has been called traffic evaporation, disappearing traffic, traffic suppression, or, more generally, reduced demand. The fact is that some traffic is displaced to other modes, and some simply vanishes, with no seeming inconvenience or disruption. This case study examines a response to intense traffic congestion, worsening environmental conditions and declining economic activity in Wolverhampton in the face of competition from other shopping centres in the city of Telford to the west, and the Merry Hill complex to the south-east, and additional planned retail centres. In 1986, the local authority commissioned ‘The Black Country Integrated Transport study’ which concluded that building more roads would not solve the growing transport problems. A more effective strategy would be to give greater priority to public transport and to put greater emphasis on improving the urban environment by creating an attractive physical space that would meet the public’s expectations. The response was a four-stage strategy, central to which was the removal of approximately 8 000 through-traffic cars per day from the city centre. The predicted traffic congestion did not occur. A significant percentage of traffic appears to have disappeared from the city centre, a result which could not be solely explained by displacement to other routes. 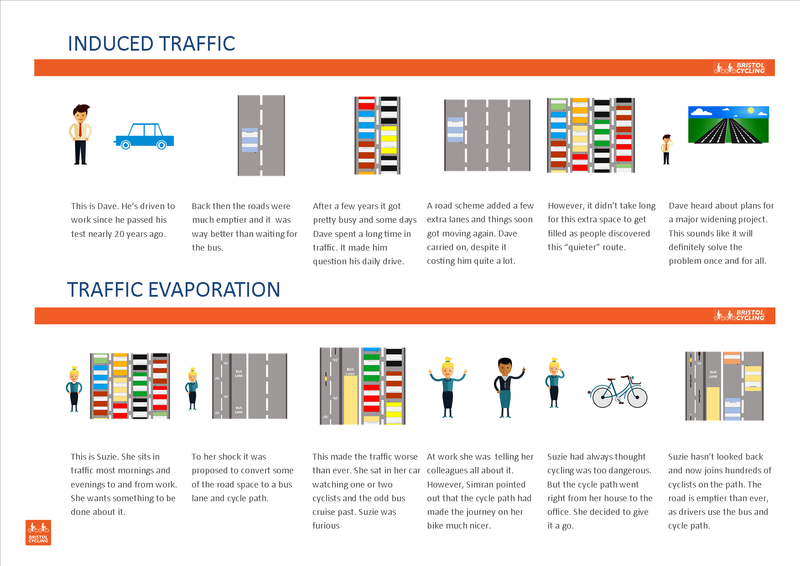 Below we’ve put together a short storyboard showing how the theories of induced traffic and traffic evaporation play out in reality.